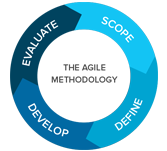 Agile is methodology that helps to build software that breaks the product development work into small increments which reduces future planning and design. This can be done by using short iterations which can last from 1 to 4 weeks. This iteration includes working functional team that helps in planning, designing, coding unit testing and acceptance testing to get the end results before releasing the product into the market. So this development is aligned with the changing business needs. This simple tutorial uses appropriate examples to help you understand agile development in a general and quick way. This tutorial has been prepared for freshers to help them understand the basic knowledge of Agile principles and its implementation. After browsing through this tutorial, you will find yourself at a moderate level of expertise, from where you can learn advance features further. Before going through this tutorial, you should have a basic knowledge of software development concepts such as software requirements, coding, testing, etc so that they can easily understand the concept.